It doesn’t take Benedict Cumberbatch to deduce that Camp Bestival is an off-shoot of Rob Da Bank’s famous Isle of Wight Bestival event. It has an emphasis on fun for all the family, running late in the high summer month of July in a beautiful little site at Lulworth castle in Dorset. Sometimes referred to in the press as Bestival’s Little Sister, there’s nothing really that little about it with space for some 30,000 guests. Line up wise this is the kind of event that will appeal to the indie crowd. Expect well known, if a little left of centre, headliners ranging from the cool end of the Dance spectrum though to classic rockers. The music is backed up with all kinds of other entertainments ranging from top comedy personalities to food tents stalled by celebrity chefs, making Camp Bestival into an explosion of popular culture. 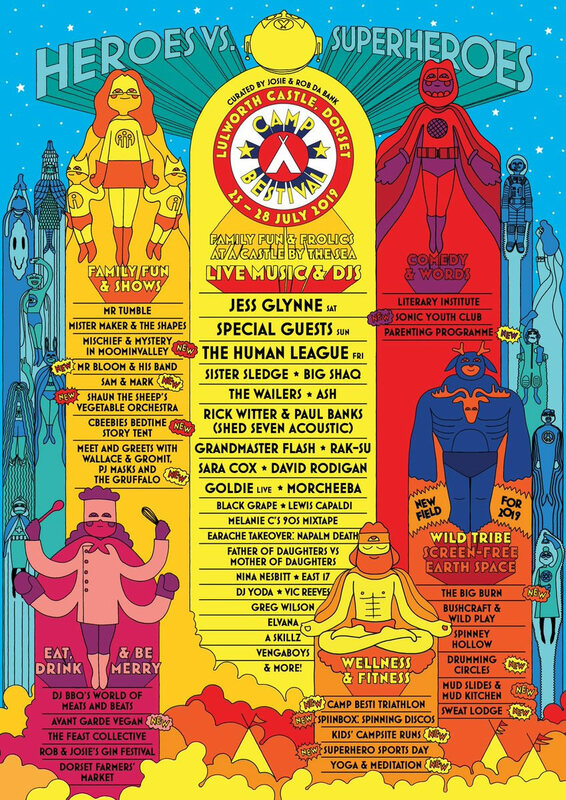 In its five year lifespan Camp Bestival has quickly ascertained a solid reputation as the place for hip mums and dads to take their offspring, winning the Best Family Festival from the UK Festival Awards in 2009, 2010 and 2013.